A long, wavelike ridge of snow . . . formed by the wind: Sastruga, a word of Russian origin. 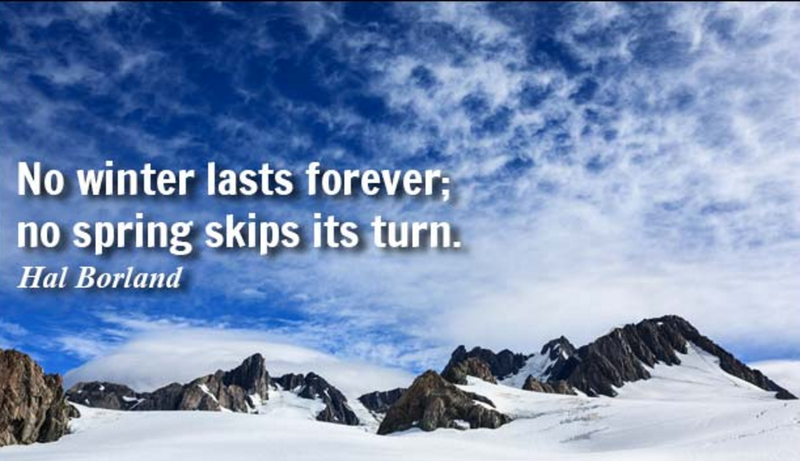 A snowdrift is a beautiful thing if it doesn’t lie across the path you’ll have to shovel or block the road that leads to your destination. New fallen snow is exquisite. But practical difficulties persist as snow lingers: messy cleanup, re-frozen slush, slick sidewalks. Did you throw snowballs during recess at school? Help make an igloo? Snow memories welcome here. How timely, Marian. Just as Winter is churning across the country and apparently preparing to dump a huge storm from the Shenandoah Valley to the east coast, including Anchor Road. We had several storms with high drifts and loss of electricity on the farm in my youth. Loved them! The most vivid storm was the 1978 blizzard in Goshen, IN, however. Anthony was a toddler. We had a potluck at the neighbor’s house. Students at the college jumped out of second floor windows into 6-foot high drifts. Your story picture would be a journalist’s dream “Frustrated Goshen Students Jump Out of Dorm Window” but their smiles of glee would cancel such a headline. I remember the blog photos you had last year of blizzards on the farm. We are planning a trip to PA in February and are hoping for snow, but not a blizzard. Thank you for starting off with snowy memories today, Shirley. The photos and quotes are great, Marian. I suppose I played in snow as a very young child in the north of England, but after we came to Australia when I was five, I haven’t seen it since. It looks so beautiful when newly fallen, doesn’t it! But Mum used to say she hated snow because of the problems it brought when it melted. I wonder whether you have childhood photos of yourself playing in the English snow. Your climate in Australia would be the reverse of our weather in the states now. I’m sitting at my computer now with a jacket on; you’re probably enjoying balmy breezes. Regardless, how wonderful that we have this online connection, Linda! More than balmy breezes, Marian! Yesterday was over 40 degrees C & today is almost 40 so far. The weather is really heating up and, instead of trying to keep warm, we are trying to cool down. A commenter/follower from South Africa (Susan below) reported sweltering weather too. Same planet – different hemisphere – opposite weather. How interesting that we can compare here, Linda. As Shirley said, we’re supposed to get a snowstorm this weekend all along the eastern seaboard. It looks like we could get somewhere from an inch to over a foot. 🙂 I also remember the heavy snows of 1978 that also hit Pennsylvania. I was supposed to start student teaching, but the schools were closed. As a young child, I didn’t experience snow often because we lived in Dallas, but I remember a heavy snowfall in Philadelphia when we were visiting at Christmas time. We got snowed in at the house of my parents’ friends, and spent the night because we couldn’t get back to our hotel. I wrote about it in a blog post a while ago. I used to call snowy wintry days Dr. Zhivago weather. My family came from the Russian steppes so this is a word we knew. Merril, when I researched the word origin for sastruga, I found varying results, the first two being Latvian and Romanian. I settled on Russian from the American Heritage Dictionary indicating broad slavic origins. Thank you for introducing me to wordnik.com. Darlene, it makes sense that you would know this word as I recall your ancestry in Russia before your family migrated to Canada. I’m glad it rang a bell. I remember snow well from my childhood,but it was more of an inconvenience and often a danger. One winter our neighbours perished driving in a snow storm; the entire family gone. It scarred me badly. Also I never enjoyed winter sports and was quite miserable when made to play in the snow. A big book in front of the fire was my idea of winter sports. No wonder I moved to the warmer west coast of Canada and now to Spain! Obviously you are a sunshine girl; it makes sense that you are spending these years of your life in Spain. 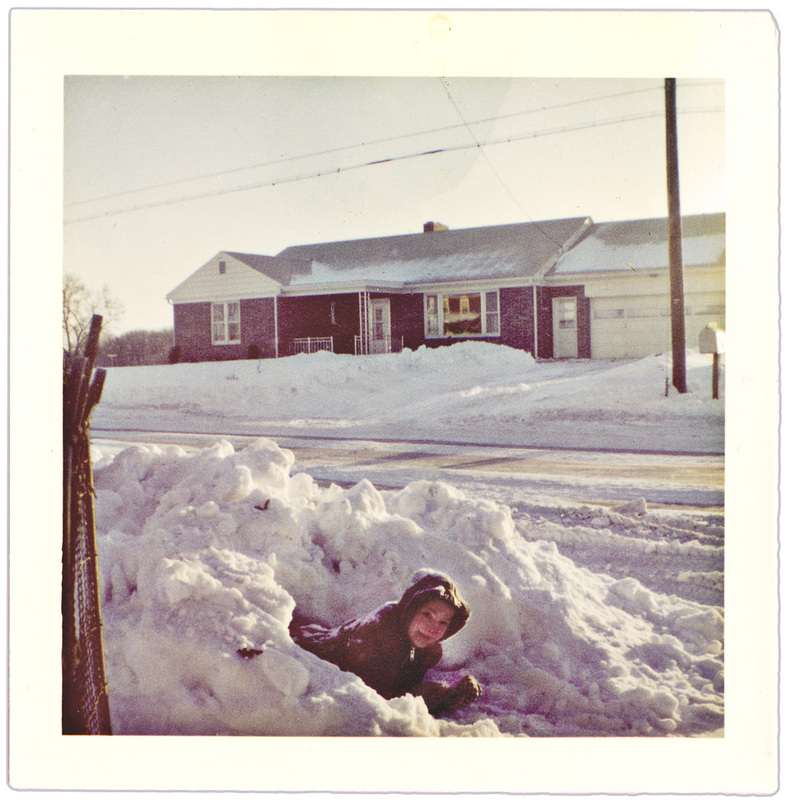 I loved sledding down the hills in our PA neighborhood and later learned to ski in my thirties. I loved it all, but now we live in Florida where the only snow we had in recent memory was about 1/2 inch back in the late 1980s. Our kids slid down a small hill in cardboard boxes as I recall. That brought back some fun childhood memories. Good morning, Anna. You must be from up north somewhere. Right? From your website, I gather that you have been a globe trotter, but happy to be in Florida at the moment. I loved these photos, Marian. Your brother in the igloo is my favorite. 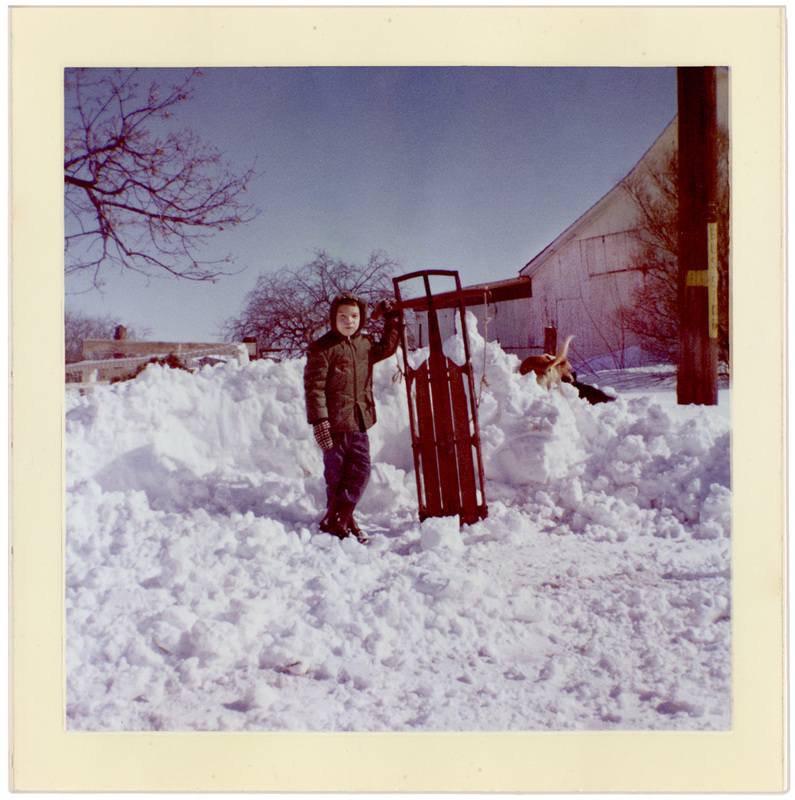 🙂 One of my favorite memories of childhood snow was the Blizzard of 78 in Washington, DC. School was closed for at least a week…what fun we had. Oh, how I remember listening to the radio in our kitchen and hoping that we heard the announcement that Elizabethtown district schools were among the closures. We frolicked in the snow too, but then school was extended a few more days in the spring.Thanks for sharing memories here, Jill. Thanks Marian for this lovely post. We get snow in parts of South Africa every winter. Where I live on the highveld in SA snow is not usual but when it does snow we get very excited, the children everywhere even more so and do the lovely creative things like building a snowman or throwing snowballs. I didn’t picture snow in South Africa until you mentioned it here. When I skied in Lake Tahoe years ago I was hit by a snow boarder, which turned me temporarily into a pencil shape. If it hadn’t been for yoga practice, I may have broken several bones. Thank you for making the connection between sastruga and apple strudel, what a lovely sounding combination. Sastruga was a new word for me too. I remember seeing it somewhere in my reading about a month ago, found some snow photos and this was the result. I’m glad you enjoyed them. Stay warm, Fatima! Love the pictures. I love the snow this year we’ve had it in spurts. I’m blessed to live in a town that is small and lovely. I have a lot of ground to enjoy all four seasons and my children and grandchildren have the thrill of their lives. We have the city park in our back yard with a tall hill where the town comes out to sled. My grandchildren spend hours out in the snow building snowmen and tunnels. They run in for warmth periodically and hot chocolate that I keep in carafes. So much fun. Thanks for another great post. Enjoy PA in February. We plan to go in June. How I miss it. Yes, Wheaton is a lovely town. I can imagine you enjoying your grandchildren’s antics looking out a window and keeping warm inside. We still have business to attend to in PA, but we plan to have some fun too. A little bit of snow would be wonderful. You might be interested in knowing about a Longenecker gathering, but it would be far for you to come. How about Jean. Could you send this to her, I will be most grateful. This is Ava Lee Longenecker Martin. My daughter, Sonja, met a gentleman at work in York whose Mother was a Longenecker. He requested to have a meeting so that he and his siblings could meet some other Longeneckers. We have scheduled this meeting on Friday, January 29, at the Lititz Family Cupboard, at 12 West Newport Road Lititz PA 17543. We have reserved their banquet room from 1-4 pm and will have the Lunch buffet which is $15.00 for 60+ seniors. Adult price is $16.50. That price includes beverages, tax and gratuities. I grew up at Bossler Mennonite Church near Elizabethtown, where there were 4 different Longenecker families, who were not my first or second cousins. Then I went to Kraybill Mennonite School where I met some other Longenecker’s, from Dauphin county. As an adult, I went to the Dr and had a nurse, Peggy Longenecker, wife of Pastor Bill. How in the world are all these Longenecker’s related. That is the question we will begin to ask and answer when we meet on Jan. 29. I am not a genealogist, but am interested in meeting people I am related to. There will be some genealogists at the meeting. The banquet room can seat 50. At present(Jan19) we have 14 registered. The restaurant would like a final count by Jan 27. If you would like to come, please call me at 717-426-3762 or email me at georgalee@comcast.net as I am taking the reservations. You are welcome to forward this email to others who might be interested or give them a phone call. PS-I may send updates as I add more email addresses for people who are interested. It’s nice to see you here, Ava Lee. I will send this to my sister Jean via email. Janice and I plan to visit PA in February, so unfortunately we cannot meet all the Longeneckers you mention next week. I’m sure you remember fun in the snow in your days on the farm! I was 9 years old when we arrived in Canada. It was late October. We had been in Paraguay for five years, to escape being sent back to Russia. I was too young to remember the snow in Europe, but our mom always talked about it and sang a Christmas song about snow falling softly. When I first saw it I was disappointed because it looked more like rain and was so uncomfortable. We had to wear heavy clothes and wrap our faces in scarves that turned stiff and snotty as we walked to school! It took some time for me to appreciate it! Thank you for adding a line from the novel you’re reading whose author re-creates a feeling I recall from long ago when driving snow swept my words away too.Your comments are always so thoughtful. I hope others read this. Marian — I love the photo of your snow-faced brother, Mark. Growing up in the San Diego area we didn’t get snow (except for way up on Palomar Mountain where the observatory is). But when I was in the third grade, Rose Elementary School released all of the children (grades K-6) to enjoy the half-inch of snow that surprised us. Like candy from Heaven, it melted almost as quickly as it landed on sidewalks, playgrounds, and stuck-out tongues! We always had plenty of snow and made snow angels and snowmen and igloos that were more of a snow fort as we never managed the curved roof. There was skating and sledding. We made yarn pompoms to go on our skates. I remember always being wet though, because all the clothes were wool…wool knit mittens, wool scarves, wool snow pants and coats, snow overshoes that allowed snow to get it over the top. We always had the wet pack-y snows, heavy to shovel but great for starting a snow man. Just start with a good sized snowball and roll it and roll it on the ground as it grew bigger and bigger, the snow just adhering itself as you rolled along. We didn’t have all the nylon snowsuits that everyone has now. But the old way had it’s advantages as we would go inside, dry out, have warm beverages and then start all over. Oh, Athanasia, our memories are practically parallel here. We often sledded down at Grandma’s house and when we got wet and cold, we’d go into her house, take off coats, boots, and scarves laying the wettest thing across her floor air ducts and then stand stocking footed on another duct, letting warm air blow up our legs. Heaven! Thanks for reviving such a pleasant memory. The weather is cool now for Florida – 30s at night and 50s during the day. Fall foliage is making its appearance now – gold and russet oak among the palms. I do miss snow. Maybe I’ll have some when I visit PA next month. 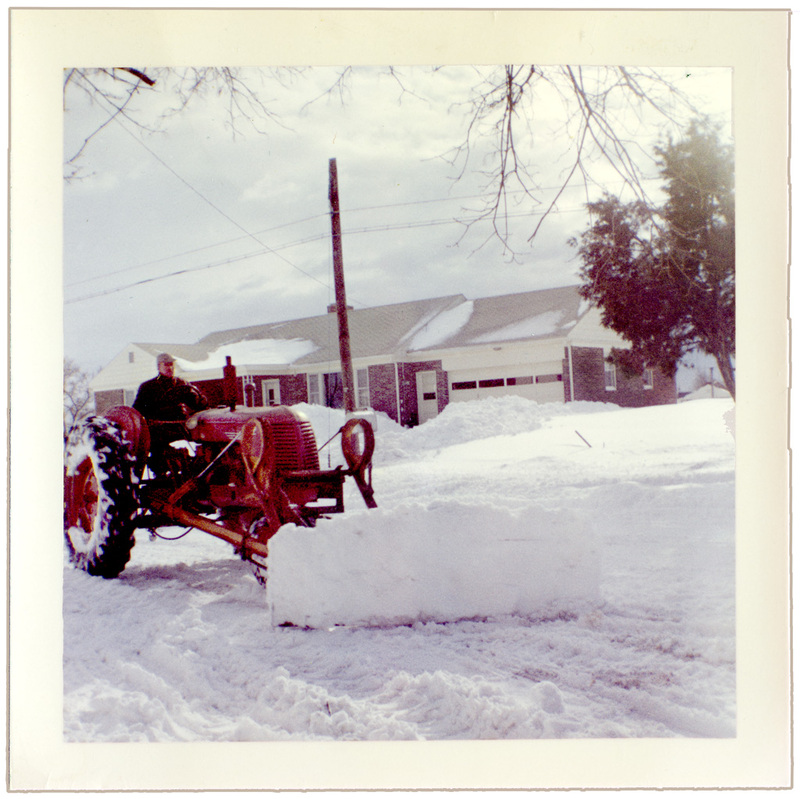 In 1956, Fort Scott got 24″ of snow during the night, and the next day another 4″. It was a “perfect” storm for us as our cousins were visiting, and we were snowed in for 3 days. We dug snow tunnels and built snow forts, and kept the kitchen floor wet with melted snow. Mom made hot chocolate and let us sleep on the living room floor near the fireplace. It was a wonderful time. Fort Scott is in Kansas – right? Grandma Fannie Longenecker used to talk of relatives we had in that state, but to my knowledge she never traveled there; I believe they came east. Your mother was wise even then, sensing this was a once-in-a-lifetime event and overlooked the mess. Anyway, that is what I imagine. Do you have photos? 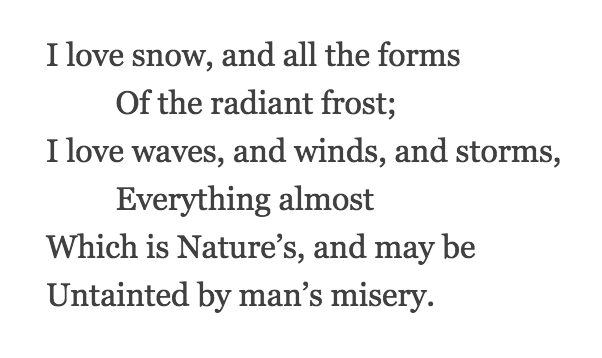 Thank you for sharing your version of Whittier’s Snowbound, Marylin. I have to enjoy your photos, Marian. We had an entire rolls of black and whites of us roasting marshmallows and peeking out of snow forts, etc., that were ruined when a water line broke and flooded the craft and storage room. So sorry – something similar happened to a box of photos and hand-made cards we had stored in the garage when a deluge of water barreled through during a flash flood. I believe we were away at the time. The storm already has a name, Jonas, arriving this weekend in the east. Because it affects tens of millions, some have dubbed it the snowcopalypse. You on the other hand, will be basking in Arizona sun, what a reprieve from Canada’s chill this time of year. I admire your keeping up with your writing life even as you sight-see. I guess you’d call it a working vacation. Enjoy! Oh I’ve been hearing plenty about Jonas, Marian. I have to wonder if it will hit Toronto. I’ve heard reports of being quite mild at home with the odd light flurry. My sister said she hadn’t heard about the incoming apocalypse, lol. It’s funny, I keep hearing of the mild weather at home and told hub that winter will be delayed and strike in March when we get home. It would be nice if we missed the bulk of it though. Time will tell about the weather, but when you say ” I imagine I may then be a bit, a bit mind you, more scarce” I have to wonder. You have the introspective writer side, but I also see the gregarious one that, like me, feels impelled to make connections. If the corpus callosum is the bridge between the two in our brains, yours/ours must be getting quite thick – lol! I guess it’s all about find balance, whatever that is! What a lot of snow you have in your patch , our country grounds to a halt with half as much and do you know what , I love it . I feel a bit cheated since living by the coast because we don’t get much snow . However whilst the bottom of my drive yesterday , way in the distance , I saw Cader Idris ( a mountain range ) topped with snow and sprinkled with sunshine it was a joy to behold . Sometimes when I read your comments, I think I’m reading the beginning of a short story, your writing is that good. And the little “dig” about your sister, sibling rivalry at its best – ha! Indeed, Marian, I do have many memories of reveling in the snow..throwing snowballs, making snow angels, sledding then skiing as an adult. Now I enjoy watching my grandkids make snow forts and have snowball fights. We always had lots of snow in the Northeast and if you didn’t find something fun do in it, it made for a very long winter. Your vintage photos take me right back to those times. We’ve hardly had any snow this year though it is plenty cold enough and everyone agrees it feels weird. Of course, I shouldn’t speak too soon. I’m thinking of my Mid-Atlantic friends who are about to get hammered and hope they’ll stay safe and warm. Thanks for another delightful post! Oh, are you actually going to escape getting hammered by Jonas? I remember last year leaving Chincoteague, snow was predicted and was starting to gently fall in the Amsterdam area. Still, you arrived home safely and on time, I believe. I first thought, “Where is Marian? Snow in Florida?” I love your photos and reflections. The front loader on the tractor is the essential snow removal tool here. I was a child in Missouri and remember heat more than snow. I was a high school student in Michigan and saw snow as an impediment to riding my bike to see friends. Now, here on my upstate New York land, snow is a friend (when it doesn’t get too pushy). I’ve had fluffy “lake effect” snow all morning and the world is fresh and bright with two or three manageable inches on the ground. Your photos bring to mind family photos of delighted boys with faces peeking out from a snow tunnel created with their dad and men cutting firewood in the forest. Then there’s the photo of our two little boys in the woods, sheepish and giggling. In front of them, the year was spelled out in the snow–pale yellow and legible. With their dad’s help, they had peed the year in the snow. Vic snapped the photo. I love how your anecdotes build toward a crescendo, Elaine. You lived in a household with lots of testosterone – ha! Where would we be without photos? It seems I’m re-assembling my childhood with slides and snapshots, some brought back to life with Cliff’s photoshopping help. We have so little snow here and it doesn’t hang around. When it comes it’s like magic. What you are talking about sounds like the dusting of snow in Disney films. What is happening now in the mid-Atlantic states including my home town is a blizzard. You may have seen predictions of Jonas in world news, scheduled to dump many feet of snow. I hope they can enjoy the beauty of flakes falling out of the sky before the digging out begins. We would never cope. More than a dusting and everything here grinds to a halt because we are not geared up for it at all. It always amazes me when I read blogs from friends in parts of the US where there are always feet of snow each winter. They seem to take it in their stride. When there are feet of snow there are snow plows, bags of salt, etc. About 20 years ago there was a dusting of snow in Jacksonville, and the city ground to a halt. Besides, there are 7 bridges accessing the downtown area and we all know “Bridge freezes before road surfaces”! Wonderful shots of the meringue like snow! 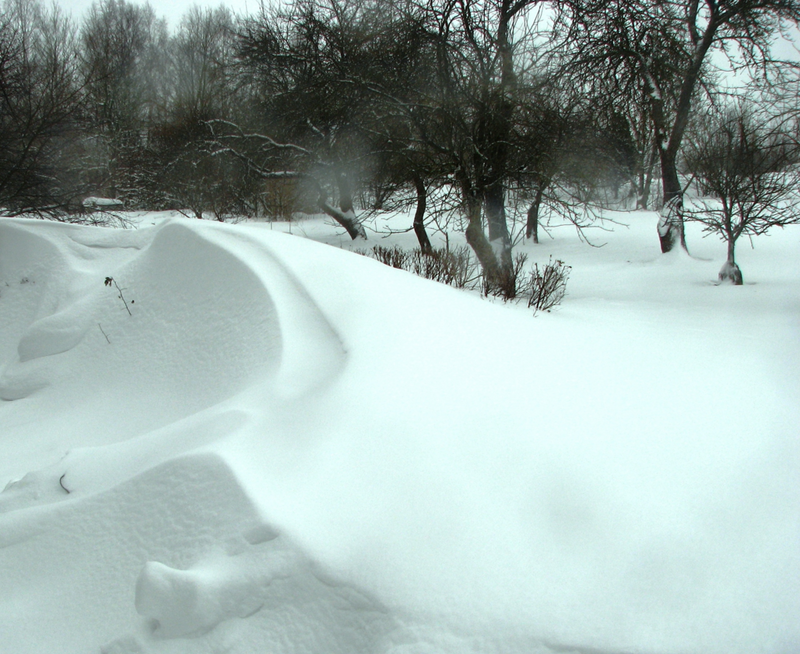 You have found the perfect word to describe these drifts – thank you, Fiona! You have a quote from your dad’s college English books – impressive! Your story reminded me of another memory I have about hazardous driving in the snow. Once I was driving the family Studebaker up a hill but didn’t have enough oomph to get all the way to the top, so the car skidded downward and landed crosswise on the road. I had my brother run to the top of the hill to signal traffic until we could get the car on an even keel. Scary! We Florida girls have no worries of snow in Florida these days. Unfortunately, my Dad’s college English book was left behind when I moved away from home. But I never forgot that quote.